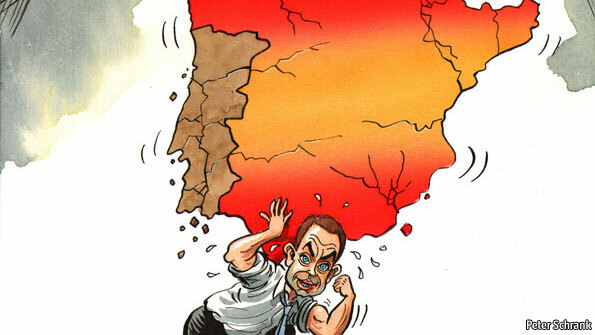 The contagion from the Greek and Irish crises has spread to Portugal, Spain and possibly Italy. Unless the eurozone undertakes radical reform there is a risk of disorderly defaults by fiscally stressed member states and even – eventually – of a break-up of the monetary union. The current muddle-through approach to the crisis is to “lend and pray”: ie, provide financing to member states in distress (conditional on such states implementing fiscal adjustment and structural reforms) in the hope that their problems are of liquidity rather than solvency. But this could lead to disorderly defaults and a break-up of the European Monetary Union (EMU), unless institutional reforms and other policies leading to closer integration and restoration of growth in the eurozone’s periphery are implemented soon. Durch mehr Zusammenarbeit und Harmonisierung will Bundeskanzlerin Angela Merkel gemeinsam mit Frankreich die Wettbewerbsfähigkeit der Krisenländer in der Euro-Zone verbessern und künftige Währungskrisen vermeiden. Doch die Kluft in der EU ist gewaltig. DÜSSELDORF/FRANKFURT. Gemeinsam mit Frankreichs Staatspräsident Nicolas Sarkozy will Merkel auf dem EU-Gipfeltreffen am Ende der Woche einen „Pakt für Wettbewerbsfähigkeit“ vorlegen. Doch während die Politiker verhandeln, driften die Volkswirtschaften der Euro-Zone immer weiter auseinander. Ökonomen befürchten, dass es so für die zum Sparen verdammten Krisenländer immer schwerer wird, den Rückstand zu Deutschland und Frankreich aufzuholen. What do you expect to be the most significant economic developments in 2011? I EXPECT one of the most significant developments of 2011 to be one I’d rather not see: deficit reduction. Recovery from recessions brought about by financial panics is notoriously slow, and I don’t expect this recovery to be an exception to that general rule, though I’d be happy to be wrong about this. Thus, rather than cutting the deficit, we need to take steps to increase the speed of the recovery or, at the very least, avoid doing things that will slow it down. If Congress had credibility, there would be no need to worry about the trade-off between helping the economy escape the recession and reducing the deficit. Congress could do what is needed to help the economy now, and promise—credibly with specific plans—to reduce the deficit once the economy has recovered. That would give us the best of both worlds. But, unfortunately, that’s not the Congress we have, credibility is not its strong suit, and legislators seem determined to demonstrate their intent with actions now rather than a commitment to take this up when the economy is stronger. This will place additional drag on an already slow recovery, and perhaps even send the economy back into recession. So let’s hope we can at least realise the promise of gridlock and maintain the status quo until the economy is on better footing. We just got a tax deal that provided some stimulus to the economy, not enough, but something, and whether or not Congress offsets this—and more—through deficit reduction is one of the more significant developments we’ll see in 2011. Which economists are the most influential? I THINK the crisis has changed relative standings. Clearly, economists who were sitting on the boards of major financial companies that got into trouble have lost stature. Economists, like Ben Bernanke and Mervyn King, who govern central banks and have made wise and bold policy moves have helped redeem the profession. Economists like Ragu Rajan who saw the financial problems coming and spoke up have gained standing. Economists like Alan Greenspan and Larry Summers who ignored and fostered the problems have lost standing.